There are basically two types of trickle chargers, the first uses electronics to insure that the trickle rate is "forced" into the battery and the second ends up suppling the trickle rate by design. The two basic types of rechargeable batteries, NiCd and lead acid, lead acid includes gel cells, both can be charged by the tenth rate method; that is, 1/10th the full power rating is used to charge the battery for 10 to 12 hours. If we have a 600 maHr battery, we would charge it at 60 ma for 10 to 12 hours. If we had a 60 AHr battery we would charge it at 6 amps for 10 to 12 hours. Needless to say, most lead acid charges are of the "dump-as-much-as-you-can-as-fast-as-you-can" variety. This type of charging is ok for liquid lead acid batteries but not for NiCds or for Gel Cells. While Gel Cells can handle much more recharge current than NiCds they can not handle as much as liquid lead acid. The idea of a trickle charger is that it can be left charging the battery continuously without fear of damage to the battery. To do this, the rate must be no more than 1/100th the power rating of the cell, and at least as high as the internal discharge rate of the cell. Most NiCd batteries will self discharge in about 3 months, or about 90 days. This means that the self discharge rate is about one percent per day, so we see that the "rule-of-thumb" 1/100th trickle charge rate was designed to offset the self discharge rate of NiCd batteries. This rule is used for all rechargeable batteries that I am familiar with. (I am not yet familiar with the newer rechargeable Alkaline batteries.) So, we need to design a recharger that can supply no more than 1/100th the current rating of the battery we wish to trickle charge. An important point is that neither liquid or gel cell lead acid batteries have this high a self discharge rate, and in fact some well designed NiCds don't either. As I described before, a trickle charger can be of two types, one that always supplies the trickle rate of current, or the one that starts higher but ends up at the trickle rate. The design and electronics for the continuous trickle charger is more involved and more expensive and require transformers of much higher voltages. The less expensive way is to design around a transformer that will supply the correct voltage/current required to be a trickle charger after the battery is fully charged. I have to admit that I simply stumbled upon my current supply of transformers and they turned out to be just about perfect for trickle charging lead acid batteries. The transformer is rated at 23VAC center tapped at 400 ma. Center tap gives us 11.5VAC at 400 ma. Remembering that the difference between RMS and Peak AC-voltage is: Peak = 1.414 * RMS gives about 16 VDC. A lead acid battery needs about 13.8 to 14 volts to charge fully. As it turns out, the little transformer with two diodes and a 25-30 ohm 5W resistor will supply about 375ma to a discharged battery, and about 40ma to a charged battery. This would be perfect for a four AHr NiCd, and experience shows that it works well for lead acid gel cell of 25 AHr or a liquid lead acid of the 70 to 80 AHr range as well as a 7 AHr gel cell. The unit I built was suppling 40 ma to each of these batteries when they reached the 13.1 volt range. 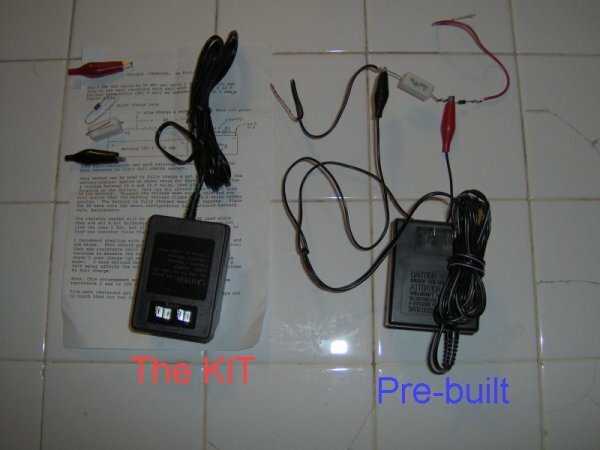 Building the trickle charger is very simple. The most complicated part is opening the transformer case (which you can skip if you want to put the protection and diodes outside.) To open the case, squeeze one edge at a time in a vice until the seam bulges. As the side bulges, use a sharp knife to find an opening (or make one) and use the blade to persuade the rest of the seam to open. You'll need to do this for the three main seams. (I use my Swiss Army Knife.) It needs to be sharp to start but we want to persuade, not cut, so use some prying force (twist the blade). If you hear a loud POP, don't be too surprised; this is the seam giving way all at once and is, in fact, the best way for it to open. I use a knife to start the process and a screwdriver to finish it. It can be finished outside of the vise. Once the three seams are open, use brute strength to pull open the case completely. It should not take much. Cut the three wires that come to the outside at a point inside the case that leaves enough wire on each end for stripping and soldering. Solder a diode to the red and black wires that come from the transformer so that the cathode (the pointed or banded end) of each diode is free. These are each one-half of the positive supply and will be attached to the red wire going to the outside. Use tape or shrink tubing to protect these connections. Now solder the output ends (the pointed ends) of the diodes together and then to the red wire that goes to the outside. Again, use tape or shrink tubing to protect this connection. Solder one end of the 25 ohm 5W resistor to the white wire coming from the transformer and the other end to the black wire going to the outside. These connections do NOT need to be protected since there is nothing to short them if you protected the positive side connections. Also, we want air to be able to flow around the resistor with as little flow restriction as possible. The white wire going to the outside has no connection, though you can solder it to the same place as the black wire from the outside and make it a second negative wire. This is the minimal circuit needed for the charger. You can add a small capacitor between the positive connection and the negative if you want. If you do that, you should also add a one megaohm resistor across the capacitor to help discharge it. These are not needed and I do not recommend them. Since the voltage is unfiltered alternating DC, the voltage will measure low on your DC meter. Don't worry, this is normal. If you simply add a capacitor to the end of the red and black wires, the voltage will climb up to about 17 volts. (This is with no load and, again, is normal.) Once you have checked this out and it all looks okay, it's time to close the case and put connectors on the ends of the red and black wires. I used Methalene Chloride to seal the case together. This is a solvent which just happens to melt the plastic of this case. Another solvent which seems to work is the one used on plexiglass-type plastics. You should be able to get that at any hardware store. Any good plastic glue should also work. The big advantage of using a solvent is that it doesn't add anything to the case to hold it together, and I know from experience that the vise technique used before to open the case will work again. Glue tends to add stuff to the situation and will need to be cleaned off if you have to do it again and I don't know how easy it will be to reopen the case. You will need to put a plug or clips on the outside ends of the red and black wires so that they can be connected to the battery to be kept at full charge. I use Radio Shack part #274-201, the two-pin male connector I described in my ARES PLUG article. It is all right to use the male connector in this case since we added the 25 ohm resistor. This resistor insures the safety and life of the transformer should we accidentally short out the red and black wires by limiting the current to 375 ma, which is below the maximum continuous current of 400 ma. To charge a gel cell (12 volt version) it should be allowed to go up to 14.4V. At that time it is considered (by the manufacturers, 14.4 - 15 volts) to be fully charged. With a battery eliminator type charger you may notice that the charge current continues to drop as the voltage increases. This is a good thing since you don't want to keep forcing 800 ma into your battery when it is fully charged anyway. Smart chargers measure the voltage & reduce the current so that they keep the battery topped off continually after the battery reaches full charge. If you measure the voltage at this time you may notice it changing from time to time as the unit senses that a bit more current is needed. Another way to do the same thing is with a resistor/diode accross the battery. Set the diode so that no current flows through the resistor when attached to the battery. Then attach a 12 V battery eliminator (one of which you no doubt have around the house someplace) accross the resistor. In this way the eliminator current is split between the battery and the resistor. Pick the resistor such that its current draw is the same from the eliminator as the battery's when the battery reaches 13.8 Volts. With the diode this should be between 13.5 and 13.8 volts on the battery. Connections: Always connect the TCP negative wire to point 3. For fatser charging connect the TCP positive wire to point 1. For maintenance charging connect the TCP positive wire to point 2. Some experimentation and much patience are needed to find the best resistor to limit the charge current correctly for a given battery. This method can be used to fully charge a gel cell. I leave the battery/charger system as shown above for days until it reaches a voltage between 13.5 and 13.8 volts, then place the BE directly on the battery, this way ALL current from the BE goes to the battery. Measure the voltage when you do this and you will notice that the battery voltage climbs to 14.4 volts rather quickly. The battery is fully charged when this happens. Place the BE back into the above configuration for continued battery care, maintenance. The resistor needed will be different for each BE used since they are all a bit different, even the ones from the same lot like the ones I buy, but if you buy a bunch you will be able to find one resistor value that is good for the majority. I recommend starting with a 100 ohm five or 10 watt resistor and the diode. This should get you close (about 13.0 to 13.3 volts) then add resistance until the battery is fully charged and continue to measure the voltage for a few days to be sure it doesn't over charge (go above 13.80 Volts when in maintenance mode). I have noticed that in this arrangement even adding a volt meter affects the voltage reading when the battery is close to full charge. Also, this arrangement works for lead acid batteries but the resistance I use is 150 ohms. Five watt resistors get HOT with the BE's I use so take care not to touch them for too long a time. Good-luck and I hope this helps. I am not finished with my experiments but this is what I have found out so far. That's KE3FL but all lower case. NOTE: If you use a credit card on PayPal please include an extra $1.00 for the PayPal fees, thanks.